Cost of Class Change reduced to 450 Varium, 25,000 Credits. To allow players to complete the Harvest Missions, Pumpkin and Candy are no longer seasonal. Omega weapons return to Nightwraith as 2018 versions! World Cup items return to Overlord Guard! The general idea behind this balance update was to broadly nerf Energy regeneration skills while buffing Bounty Hunters, who've had trouble coping with endless regen builds. Legends were also slightly buffed. These adjustments are small and meant to pave the way for more comprehensive balance updates in the future, likely as soon as next week. Wait. What? A release? Yup! I posted a tweeet a few weeks ago asking what themes for Arcade games players would like to see and I was flooded with ideas and suggestions for release content. 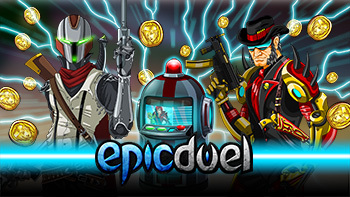 The EpicDuel community is still hungry for new releases and possesses an incredible passion for the game. This moved me to devote my efforts to giving EpicDuel the attention it deserves! I'm not a programmer like Titan or Rabble so I can't promise any big features, but I'll do my best with the game as it is. The Arcade machines scattered throughout Delta V but mainly concentrated in Valestra's Arcade have been sadly neglected since their introduction. Years ago, we updated the Arcade with several games themed after popular items from other AE games. I've put out the call again and received some great items to adapt to the world of Delta V! The Arcade is something I hope to expand further so if there are other themes you'd like, let me know! In addition to being a great way to win cool weapons and home decorations, Arcades are also excellent for boosting rating points! I've boosted the achievements for Arcades to all have 3 more tiers. This will result in a HUGE rating point boost for those who've dominated the leaderboards. Don't fret, though! I've also boosted the Rating Point system include 2 more tiers: Platinum and Regal Stars! Currently, nobody has hit the existing cap, but with the addition of new achievement tiers, I expect a few lucky souls to cross the threshhold to the new tier! Who will be the first to go Platinum? They're not as powerful as they were originally, but it's a start. We'll see how this changes balance and go from there. Another area I will address is the potency of energy regeneration skills by reducing their effectiveness. These nerfs will be broad but not severe as I'd rather proceed with a scalpel than a mallet to address balance. My goal is to offer balance updates weekly to keep the game fresh and try to nudge the classes to some sort of equilibrium. By popular request, I've decided to bring back the Omega Weapons with some special conditions. First, they will be rebranded as 2018 editions, allowing the originals to retain their rarity score. Second, they will be available in-game at Nightwraith for Varium only. This was a tough decision, but it seemed most fair to those who joined us during Omega but missed out on those awesome weapons. Since we're still in Omega, it just made sense to give people another chance. I'm not sure how long they will remain in game, but since they're tagged RARE, it won't be forever! That's all for now. Back to work! Hopefully this will be the first of many successful updates to EpicDuel!